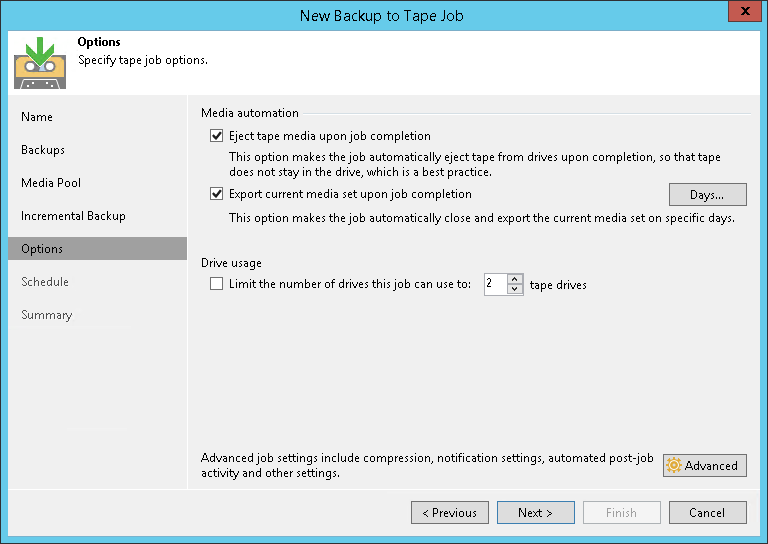 This step of the wizard is available if you selected a regular media pool at the Full Backup step of the wizard. Select the Eject media upon job completion check box if the tape should be automatically ejected from the tape drive after the job successfully finishes. The ejected tapes are placed into a free tape device slot. Note that if the job started and failed, the tape will remain in the drive. This option does not prevent the tape job from appending data to this tape. If not configured otherwise in media pool settings, this tape will be placed into a drive on the next tape job run. Select the Export current media set upon job completion check box if you want to pull out the tapes with the current media set from the tape device, for example, to move to a storage location. The tape device will eject the tapes that belong to the current media set when the media set is closed. If you want to export tapes on specific days only (for example, every Saturday), click Days and schedule export on the necessary days. Note that with this option selected, a new media set is started after each export. Click Advanced to configure the advanced job options.